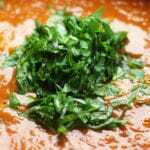 With layers of flavors, this Tomato Basil Soup recipe is an easy and comforting dinner. 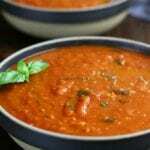 Using both fresh and San Marzano tomatoes creates a naturally thick, healthy and crazy flavorful soup. Preheat oven to 400℉. 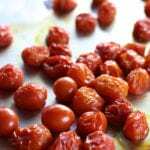 Place washed grape tomatoes on a cookie sheet (without oil) and bake until tomatoes start to burst and become slightly roasted, about 20- 30 mins. Meanwhile heat a coated or non reactive dutch oven over medium/high heat. Once heated turn heat down to medium. 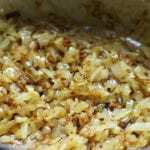 Add olive oil, butter and onions and sauté to a medium caramelization, stirring occasionally. Add garlic, oregano, dried basil and tomato paste to caramelized onions. Cook for another 1-2 mins, stirring well. 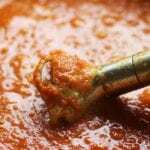 Add canned tomatoes, grape tomatoes and broth to dutch oven, stir well. Add in parmesan rind. Bring to a rolling boil over medium/high heat and then lower heat to a simmer for 30 mins. 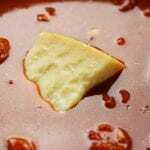 Once simmered, remove parmesan rind and blend either using an immersion blender or standing blender. Add julienned basil and simmer for an additional 5 mins. Salt and pepper individual bowls to taste.